Discussions Magazine Music Blog: The Shins' James Mercer and Danger Mouse releasing debut Broken Bells album! The Shins' James Mercer and Danger Mouse releasing debut Broken Bells album! James Mercer and Brian Burton a/k/a Danger Mouse have completed work on the first album by their new and ongoing band Broken Bells. 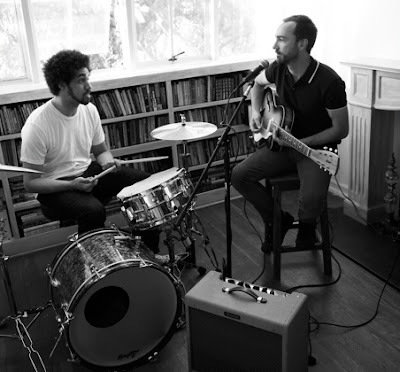 The album, also titled Broken Bells, will be released by Columbia Records March 9, 2010. The album features 10 melodically seductive and psychologically provocative songs co-written and performed by Mercer and Burton. Titles include "The High Road," "Vaporize," "Your Head Is On Fire," "The Ghost Inside," "Sailing to Nowhere," "Trap Doors," "Citizen," "The Mall and Misery" and more. Broken Bells features Mercer on vocals, guitars and bass while Burton plays organ, drums, piano, synths and bass. The pair play all the instruments on the album with the exception of a full string section arranged by Daniele Luppi. Broken Bells was recorded by Todd Monfalcone and Kennie Takahashi at Mondo Studio in Los Angeles and produced by Burton. Each a long-time fan of the other's work, Burton and Mercer first met face-to-face backstage at the 2004 Roskilde Festival in Copenhagen. The pair immediately hit it off and kept in touch over the prevailing half decade and in May 2008 seized the opportunity to finally collaborate on original music together. Once in the studio, the musical floodgates opened, an intuitive ease and seemingly ego-less telepathy producing an astonishing flow of new material over the course of a year. From more than 20 pieces of new music written and recorded, Broken Bells was assembled from 10 songs that coalesced together the most seamlessly. Brian Burton a/k/a Danger Mouse has been nominated for 11 Grammy Awards, as both an artist and a producer, winning two in 2006 -- Best Alternative Music Album (St. Elsewhere) and Best Urban/Alternative Performance ("Crazy") -- for his work with Cee-Lo as Gnarls Barkley. Picked by Esquire magazine as one of the "75 most influential people of the 21st century," Burton has previously collaborated with a range of artists including Beck, Gorillaz, the Black Keys and others. James Mercer is best known as the founder, principle songwriter and frontman of The Shins. The Portland OR-based group's massively successful third album, Wincing the Night Away, debuted at #2 on the Billboard 200 album chart in January 2007, becoming the highest charting album to have ever been released solely on the iconic SubPop label before its nomination for the 2008 Grammy Award for Best Alternative Music Album. Mercer and Burton previously worked together on the track, "Insane Lullaby," a song appearing on the Dark Night of the Soul multi-artist collaboration with David Lynch. I'm fairly excited about this. They're a pretty interesting duo...you heard about their viral clues http://tiny.cc/S4UZx ?